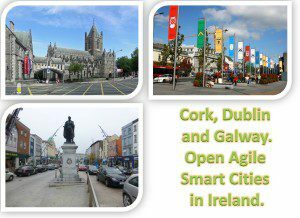 Today, June 12, 2015, three Irish cities have signed the Open & Agile Smart Cities (OASC) Letter of Intent to join the 2nd wave, effectively forming OASC Ireland. The cities are Cork, Dublin and Galway. This initiative should allow for rapid progress to be made in developing smart initiatives in all three cities. The three Irish cities are being supported in this initiative by the Insight Centre for Data Analytics, one of Europe’s leading internet research centres with over 300 researchers. Insight has research centres based in University College Cork (UCC), Dublin City University (DCU), Trinity College Dublin (TCD), University College Dublin (UCD) and the National University of Ireland Galway (NUIG). The initiative is being led from Galway by Dr Martin Serrano who specialises in Smart Cities and IoT along with Insight’s eGovernment group led by former United Nations researcher Dr Adegboyega Ojo and supported by Niall Ó Brolcháin, a former Mayor of Galway City and a long-time advocate of Smart Cities. Martin Serrano is on the board of the Connected Smart Cities Network, which oversees the OASC Task Force, and is well respected throughout the world for his work in developing the Smart City concept. He believes that Ireland is the right size and has the right political and technological environment to lead the way in terms of developing Smart Cities. Adegboyega Ojo, head of the eGovernment Unit at Insight welcomed the initiative, saying, “We are delighted that Dublin, Cork and Galway have signed up for this initiative. The eGovernment unit at Insight works closely with Public Authorities and Governments in the Republic of Ireland and other parts of the world in the area of open government. We also recognise the importance of continuing to develop our relationships with local cities in Ireland in harnessing open and big data driven innovations towards improved quality of life for residents”. According to Mark Bennett of Dublin City Council, “Cities are going to be leaders of change. Dublin could raise its profile in a way that would help sell Ireland”. Open & Agile Smart Cities are only getting started in Ireland but a lot of the building blocks are already in place. There is a real appetite for all things smart and all the signs are that rapid progress will be made in this area. See the List of Open & Agile Smart Cities for a full overview of signing cities and countries.